The market leaders, Waltons, bring yet another superior quality shed. The 3.59 cubic meter interior makes for sufficient storage space for storage of your gardening tools and equipment. 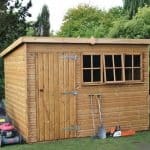 It doesn’t necessarily have to be used a tool shed either; you could very well transform it into a playhouse for the children. No matter how you use it; you will not regret your purchase. 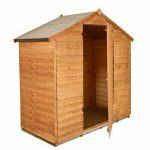 Its size allows ease of assembly and makes it possible for the shed to be placed wherever you choose. The shed comes with a 10-year anti-rot guarantee too. The ‘Styrene’ glazed windows make for a safer and more environment-friendly alternative to the standard glass windows. Safety is ensured by the butterfly catch, another feature of the shed, and the interlocking cladding ensures the structure lasts long and is durable. 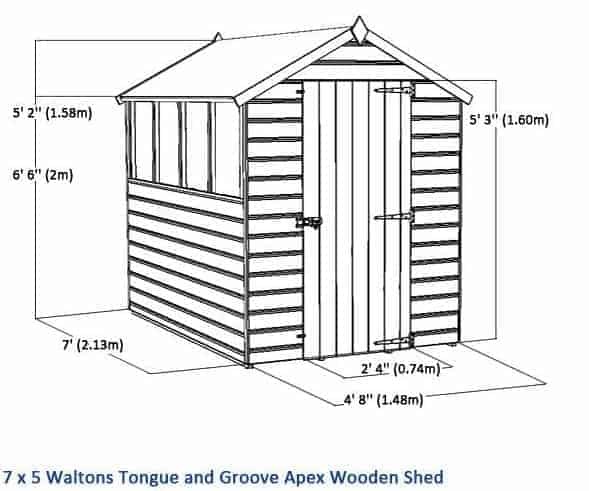 Let’s take a look at the features of this 7 x 5 tongue and groove apex garden shed. The many features of this building are specifically designed to provide maximum satisfaction to the customers. 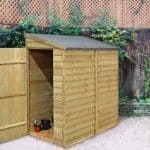 Buy this traditional shed and give your garden the appealing look it lacked. Combined with a spacious interior, it is a must have for all the gardeners. The apex roof measuring 2.00m in height is a useful feature that will work to keep your shed clean and dry. 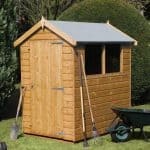 Tired of bumping your head on low roof garden sheds? Not with our 7 x 5 garden shed. The 1.58m high eaves provide generous headspace. You can walk around easily and store your tall tools in a clutter-free manner. The roof is constructed using Oriented Strand Board (OSB). Since these boards are moisture resistant, you don’t have to worry about knots or voids. 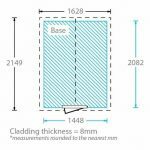 The 8mm solid sheet board is hardwearing and will add stability to the already sturdy structure. Mineral roofing felt protects the roof against winter weather. Or you can get extra protection by upgrading to the Superior Duty Felt. Fibre glass makes the felt incredibly strong. It gives an immaculate finishing look and that too without the use of adhesives. The shed measures 1.48m in width and 2.13m in depth, and its doors measure 1.60m in height and 0.74m in width. 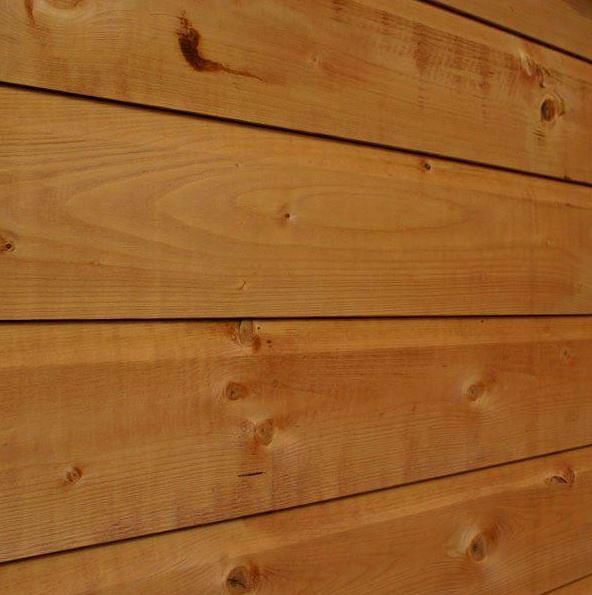 12mm thick shiplap tongue and groove was used for cladding. It can not only withstand harsh weather but also adapt to it. There’s room between the boards so they can contract or expand thus preventing the shed from warping. 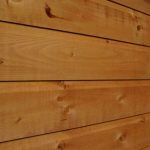 Even though the material used for cladding is the most expensive and durable one, the product comes at quite a reasonable price. The structure is supported by double-framed corners which provide enhanced strength and stability. The shed comes with the floor included but we recommend upgrading to Extra Strength Floor Support Pack. It will give you the freedom of storing heavy equipment and machinery or working inside the shed. 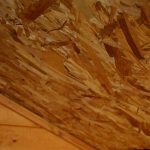 Since it keeps the base above the ground, there are less chances of water damage. Immediate and regular treatments are required if you wish to avail the 10-year anti-rot warranty. Just like all the sheds manufactured at Waltons, this shed too comes pre-treated with a water-based timber treatment. But it requires an immediate treatment shortly after assembly. Treatments must be repeated in accordance with the manufacturer’s instructions. Use a high quality, spirit-based preservative to protect the material from adverse effects of weather. 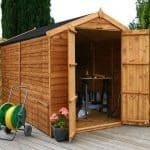 Frequent treatments will give your shed a professional finish that will be the envy of the neighbourhood. 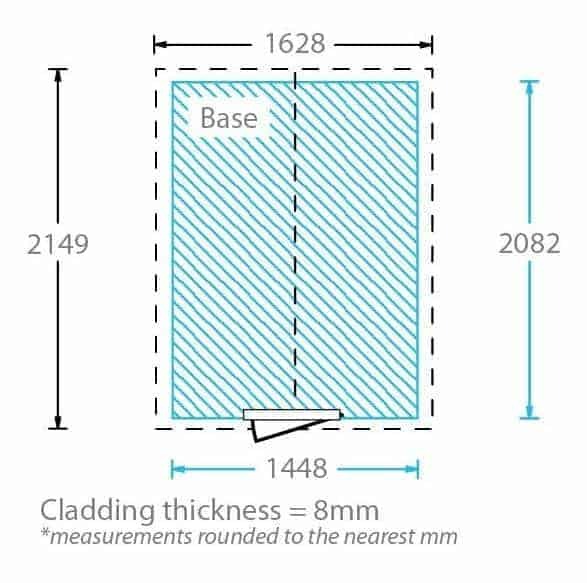 The shed comes with a single door, but its measurements, 1.60m in height and 0.74m in width, facilitate easy access to all your tools and equipments. The ledge door has a Turn Button (butterfly) catch but it can be fitted with a pad bolt for additional security. The windows are glazed with 2.5mm of Styrene, an environmental friendly substitute of conventional glass. It is shatterproof and gives a sense of added security. If you plan to work in your shed, the windows will flood the interior with light during daytime. The Ledge Door can be fitted with a staple and hasp, which will provide security and privacy. But the large windows will leave the interior quite visible, rendering the added security useless. It will be practically more effective to buy a windowless garden shed if you intend to store valuable stuff in there. The product comes with the option repositionable window panel. Customise the shed just the way you want. Place the windows on either the right or left side, depending on where you plan on setting up the shed. You always get the best, high-quality product from Waltons. 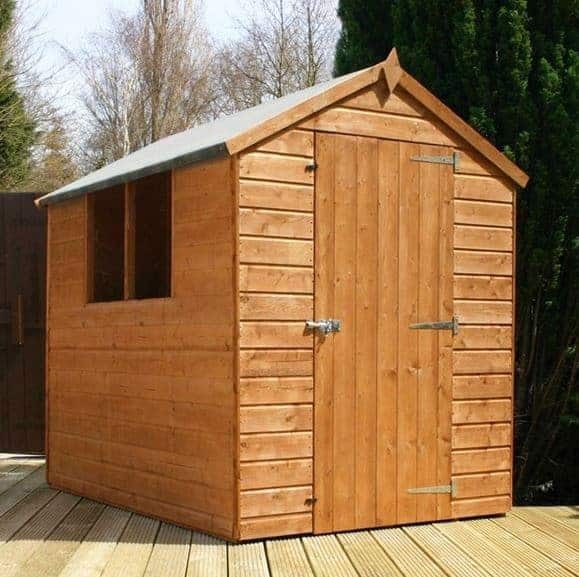 The 10-year anti-rot warranty further ensures that the quality of the shed cannot be faulted. The manufacturers pre-treat the shed and advise customers to use high quality preservative for regular treatments. If they are followed as per the manufacturer’s instructions, your shed will last years. You can upgrade to Extra Strength Floor Support Pack and Superior Duty Mineral Felt to secure your shed from weathering. The interior can accommodate your gardening tools and equipments easily or you can turn it into a work shed, in both cases it has the space you want. The manufacturer recommends that 2 people should assemble the shed. Although it is smaller than many sheds in the range, but it’s safer to have a person assist you. In case you don’t want to go through the hassle, the professionals at Waltons can do it for you. For that you’ll have to access their Home Installation Service. 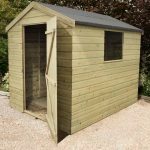 Reasonable price in spite of the high quality timber structure is all you need to assure you of the shed’s value for money. Final Thoughts: Since the product comes from industry leader, Waltons, you can rest assured that no compromises were made on the quality of the product. 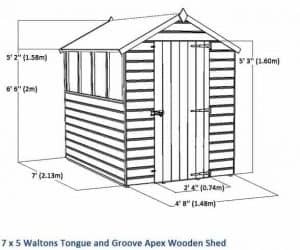 The timber structure, shiplap tongue and groove cladding, and the apex roof make this 7 x 5 Tongue and Groove Apex Wooden Shed the perfect storage solution.